The Wagga Wagga and District Historical Society has been collecting items of local historical value since 1962. A small portion of the Society's collection is stored at CSU Regional Archives. The items, which are mostly paper-based records (including photographs) are currently being digitised and will be progressively added to this gallery over the coming months. Correspondence from Alexander Davidson to the NSW Crown Lands Office regarding a boundary dispute between himself and Henry Osborne. Photograph of an unidentified newlywed couple. 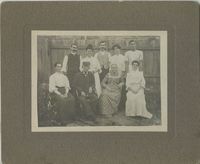 Unidentified family portrait situated in outdoors. Photograph of woman holding an infant. Inscription on reverse side: "Macklam". Photograph of a young girl posing with a woman. A photograph of a young girl seated on an older man's lap (possibly her grandfather). The photograph has been hand-coloured. Photograph of an unidentified young girl standing on a chair with a basket. Studio photograph of an unidentified girl leaning against a table. Studio photograph of an unidentified infant. Photographic postcard showing the Wesleyan Church, on the corner of Johnston and Tarcutta Streets, addressed to Mrs Melvin. This church was officially opened in October 1949. A hand-coloured photographic postcard addressed to Nurse Melvin. The photograph shows Baylis Street around 1900. The photographer is facing south, standing at the corner of Baylis and Morrow Streets. A hand-coloured photographic postcard showing the Wagga Wagga Post Office in Fitzmaurice Street around 1900. A hand-coloured photographic postcard addressed to Miss K Melvin. The photograph shows Gurwood Street around 1900. The photographer is facing west, standing on the verandah or roof of The Commerical Hotel in Fitzmaurice Street. A hand-coloured photographic postcard addressed to Nurse Melvin. The photograph shows Fitzmaurice Street around 1900. The photographer is facing south, with the photograph including the Gurwood Street corner. The business of Morrison and Daley on the corner of Fitzmaurice and Gurwood Streets. Wollundry Lagoon suffering from drought. The photograph is taken from the west side near the Town Hall Garden. This photograph depicts some kind of event outside the Wagga Wagga High School on the corner of Macleay and Coleman Street. There is a crowd gathered outside the building which is festooned with Australian flags and Union Jacks. The Wagga Wagga District Hospital on the corner of Edward and Albury Street (now Docker Street) soon after its construction. The building's official opening was held on 7 September 1910. A view of the viaduct railway bridge that spans the Murrumbidgee River at Wagga Wagga. A view of the Wagga Wagga Company Bridge from the west bank of the Murrumbidgee River.